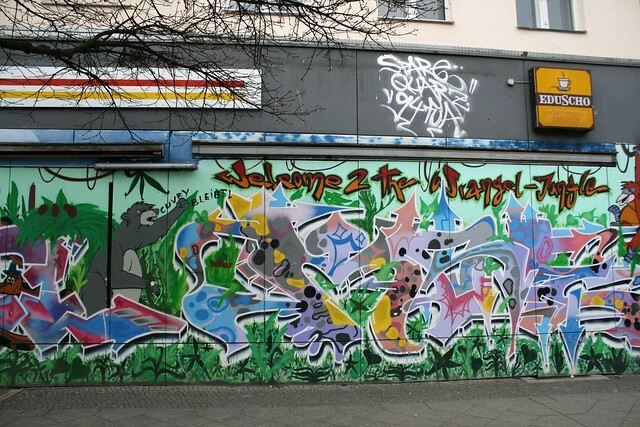 Wrangelkiez, Kreuzberg, Berlin, Germany – deutsch, bitte! 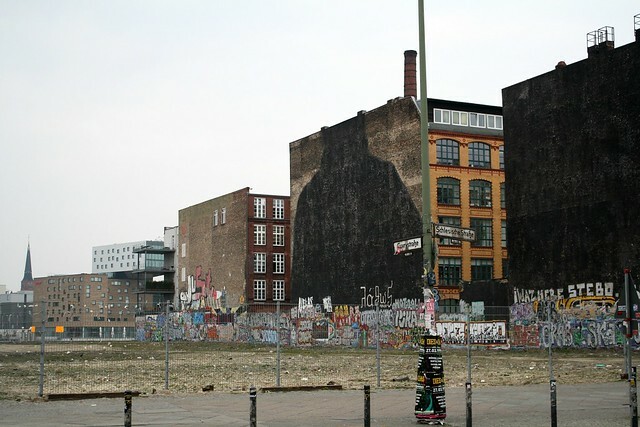 Welcome to my neighborhood, Wrangelkiez, nestled on the eastern edge of Kreuzberg. For those of you who don’t know, Kiez is a word used in certain parts of Germany (mostly Berlin and surroundings) to designate specific neighborhoods. Though people throw this word around a lot, generally a Kiez refers to a self-contained area, i.e. one that has everything you need within a few blocks, and it takes its name from the main street. In our case, the “center of life” is Wrangelstraße, hence the Wrangelkiez. 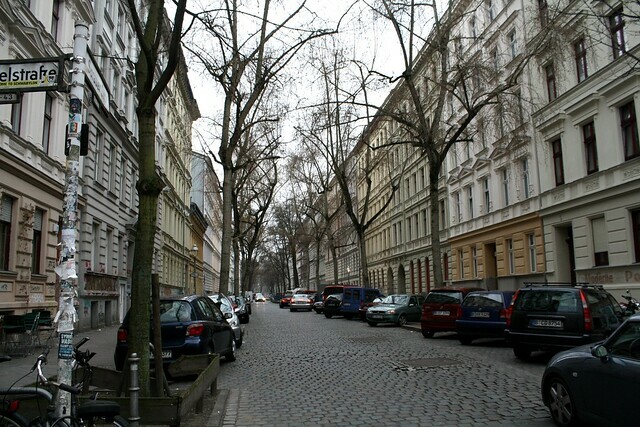 Our neighborhood has around a dozen streets, and it’s bordered by the Spree River and Friedrichshain, the Landwehrkanal and Treptow, Görlizter Park, and Skalitzer Straße. Above, you’ll see the Jungle Book-themed artwork adorning one of the corner shops: Welcome 2 the Wrangel-Jungle. The reason I’m taking you on a little tour of my neighborhood is because I signed up to do so as part of the Piri Piri Lexicon’s Show Me Your Neighbourhood series, where people around the world take some shots of where they live. I’ve enjoyed reading about the diverse backgrounds and homes of some of the participants, and of course I love where I live, so it made perfect sense. 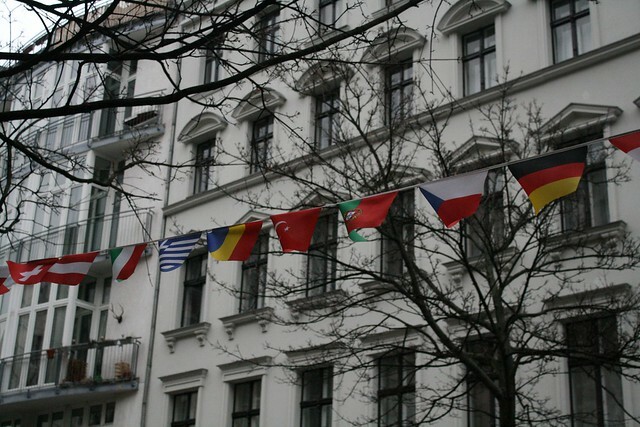 Above is a photo depicting a string of flags that hangs outside a local Döner shop. I find it’s rather representative of our neighborhood, as somewhere around 1/3 of the people living in Kreuzberg are not even German citizens, making it a very multicultural part of the city. Wrangelkiez is perhaps best known for the famous street art murals by Blu. But the lot where these works were, the Cuvrybrache, has been contested for years, and was finally cleared at the end of 2014 to make way for new developments. As a form of personal protest, the artist himself got rid of the artwork. A lot of people are bummed about this turn of events, but I think the blacked-out artwork still makes a powerful statement. 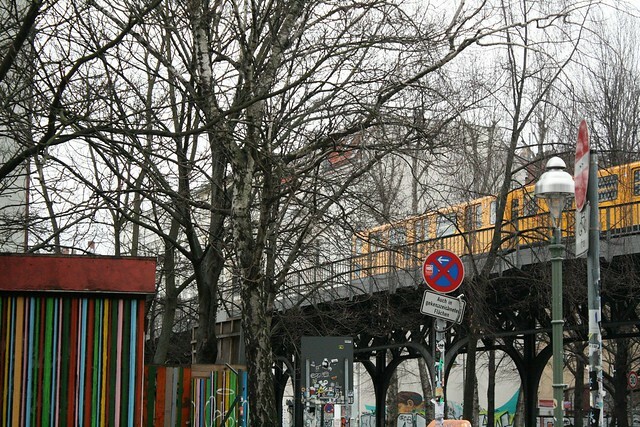 One of the main modes of transportation in this area is the U1 line, which runs east-west. Our stop, Schlesisches Tor, is the pentultimate stop, or the second one, depending on the direction you’re heading. Though it’s the underground line, the U1 actually runs above ground for 8 of the 13 stations. Here you can catch a glimpse of the famous yellow cars with decals of the Brandenburg Gate on the windows. However, if people aren’t taking the U1, a lot of them are walking, or biking. As you can see here, there are a lot of bikes in my neighborhood, and all over Berlin, really. These ones are parked outside Beumer & Lutum, a local bakery, and my favorite one in the area (aside from the Turkish one where you can buy fresh-baked Pide for €1 each. There are a few B&L locations in Berlin, but this is the one where they do the baking for all the spots. They also sell really tasty vegan Splitterbrötchen, which is part of my morning ritual at least a few days a week. As I mentioned before, there are about 12 streets in Wrangelkiez, and they all vary a bit in how they look. This one is more of a side street, in that it’s mostly residential buildings and not very many businesses. As such, it’s much more quiet and idyllic than some of the streets that receive much more foot traffic. There’s no such thing as a “typical” building in our neighborhood, since there are so many variations. Some are newer, uglier, character-less buildings, but others like this one have gorgeous, ornate facades. I picked this one to show because it’s one of my favorite ones to look at, and I walk by it almost daily. Half a block away from the building shown before is Kaiser’s, the “main” supermarket in the area. 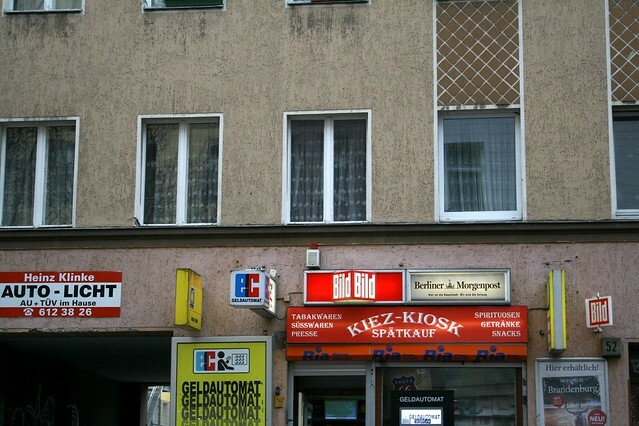 There are various shops in the neighborhood, including a Turkish store (Eurogida), a corner store (Nahkauf), and smaller, privately owned places. 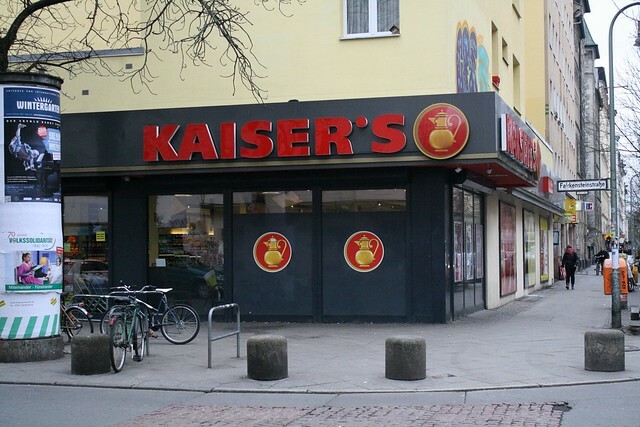 The Kaiser’s is probably the biggest (aside from the Eurogida), though it’s actually quite small in comparison to other locations, and we don’t do much of our shopping here anyway. 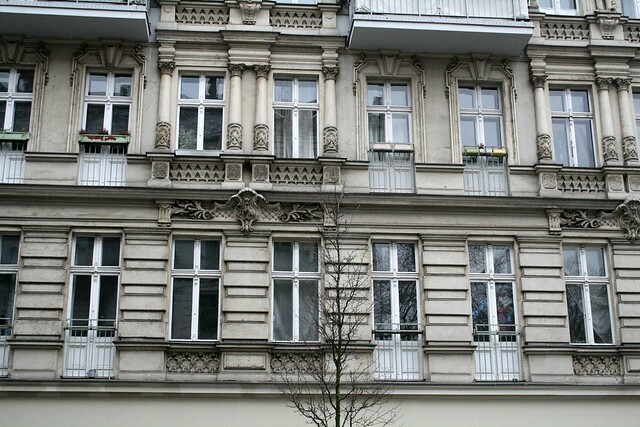 It’s located at one of the busiest intersections in the neighborhood, Wrangelstraße and Falckensteinstraße. The latter is very much a tourist street. 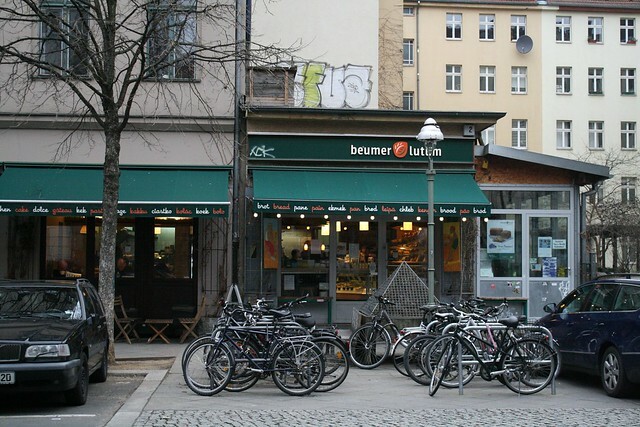 In addition to your regular stores, no Berlin neighborhood is complete without a Spätkauf or two. Literally translated to “late buy,” these kiosks are open until the early hours of the morning, and they sell all kinds of snacks, refrigerated beverages, newspapers and magazines, etc. Berliners affectionately call them Spätis, and it’s not unusual to have a favorite one that you always go to. With so many of them (at least one per block on busier streets), it’s important to have some kind of character to make people want to go to your shop. There are countless schools of all varieties in the area, though I think the Kita (daycare) is the most common—we have three or four on our block alone. 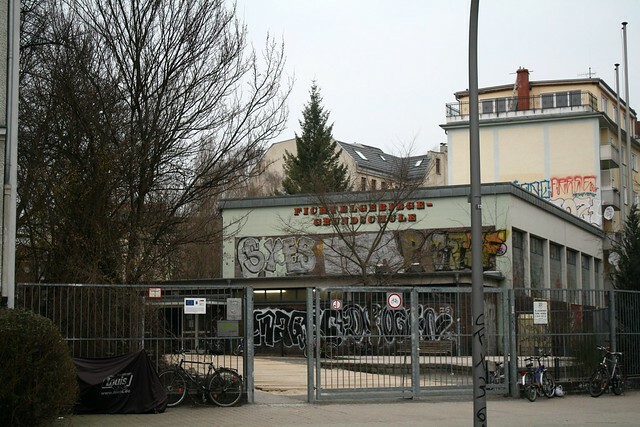 This is a Grundschule, the German equivalent of an elementary school. There might be others, but I am not sure, as (being totally honest) it’s not something I really pay much attention to. Surprisingly, I didn’t see a playground on the school grounds (though I didn’t look too hard), but there is no shortage of places for kids to play. 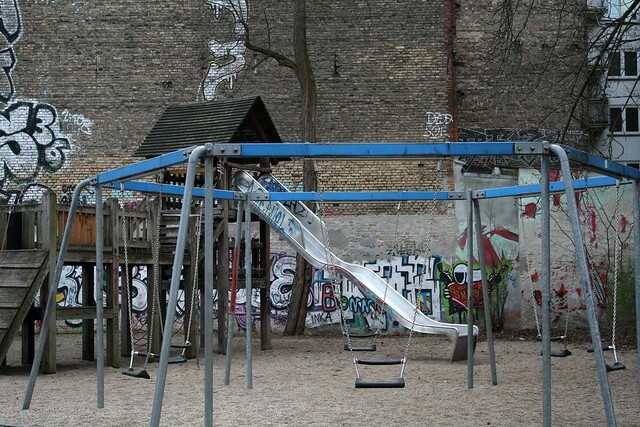 In fact, there are three playgrounds within a two-block radius of our flat, and that’s not counting the ones in backyards that are either part of a kindergarten or for the residents of a particular building. Plus, there are green spaces, such as Görlitzer Park on one side of Wrangelkiez and Schlesischer Busch just across the canal. The playground above is located adjacent to a community center, and (as is common with playgrounds around here) is also home to a lot of graffiti and street art, which gives it a bit of flavor. 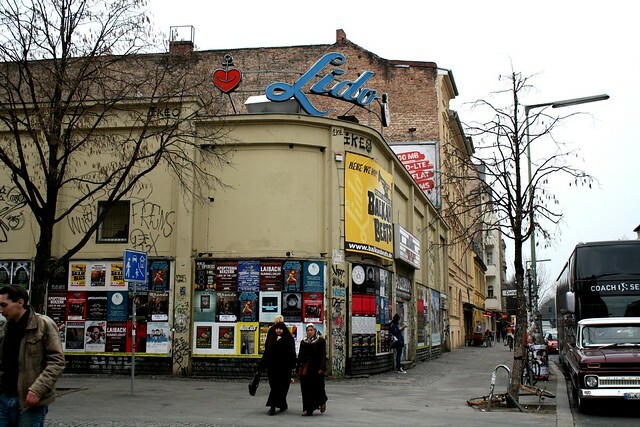 Next up, we have Lido, a mid-sized music venue. In Wrangelkiez alone, there are five venues for live music: Lido, Magnet Club, Comet Club, Bi Nuu, and Madame Claude. In addition, there are clubs for electronic music, and bars, cafes, and shops that feature acoustic sets or jazz groups. All in all, there’s a lot to do, see, and hear.